Soaring property prices in Sydney are likely to spark a fresh wave of migration into south-east Queensland, according to Macquarie Bank researchers. Need to get up to speed on the South East Queensland property market? Macquarie's equity strategy team said the economic fundamentals had aligned, "for another great wave of interstate migration into Queensland". "Sydney house prices are nearly double those in the other capital cities and job creation in Queensland is on the rise," the Macquarie team wrote in a note to clients. If history was any guide, Macquarie argued, then about 130,000 people would make the trek north over the next three years, bringing with them a large transfer of wealth. While an average of 134,000 left New South Wales in similar circumstances in the mid-1980s and mid-2000s, that didn't translate into a loss of population in Sydney as overseas immigration and natural growth led to an average net gain of 330,000 over those periods. 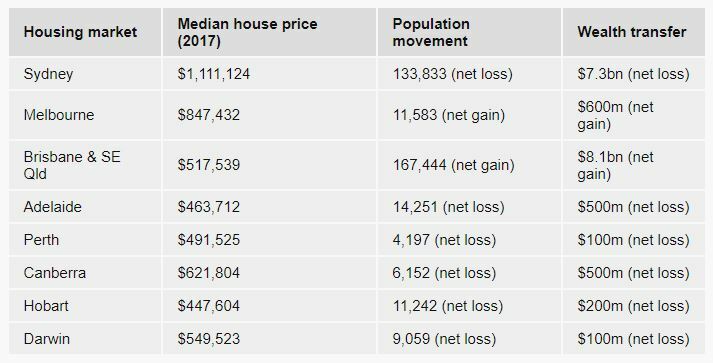 "However, probably the most important aspect of this is not the number of people moving, but the fact that they are asset-rich," Macquarie noted, with the wealth being built by Sydney property prices over the past decade. "We estimate the housing equity transfer could be around A$8.1 billion into the region, with the bulk coming from NSW [$7.3b billion]." While $8 billion represents about a quarter of current annual real estate turnover in and around Brisbane, it would be a relatively small drain on the Sydney market — about 10 per cent of annual turnover. Macquarie noted a migration on this scale would not only go a long way to absorb the current over-supply in the Brisbane apartment market, but would also be likely to drive real estate prices higher. Source: ABC News.